Four miles from Plymouth city centre, in Elburton, is Plymouth Footgolf. The course weighs in at 652 yards and is played over 9 holes which comprise of a mixture of technical, long and short holes, with plenty of challenge and diversity. Open daily from 9am until dusk, this is a great opportunity for families and friends to get out and enjoy the fresh air whilst having some fun. On site is a driving range, as well as a café with Wi-Fi and visitors are welcomed to make a day of it. The club provides size 5 footballs, so if you’re new to the game it is no problem to turn up and play. Just don’t wear studs or spikes: trainers are ideal. 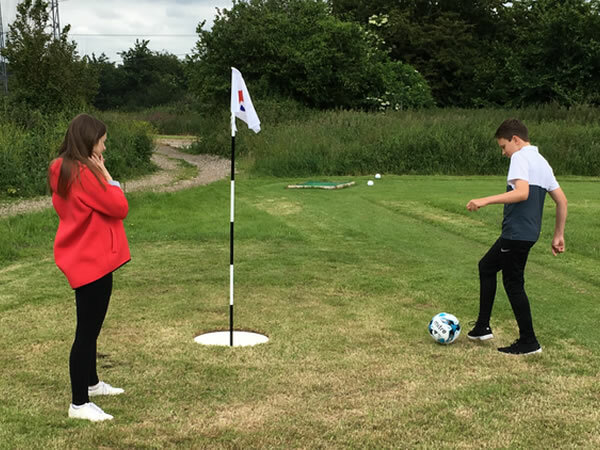 In addition, Plymouth Footgolf offers holiday Footgolf camps for youngsters, giving them something new and active to do over those long holiday days. If you haven’t tried Footgolf yet, don’t miss out! This course is a 9 hole course. All 9 holes are short in distance, very suitable for young children. There are only a few trees, rough areas slight slopes and bushes as obstacles but they cause little issue. The pars seem spot on for the difficulty of the holes. The same course is used for their pitch and put golf aswell with the golf hole located near the football golf one on each individual green with a different colour flag. This course is open all year round (I think - weather dependent) which is good for availability. Plenty of free parking is available on site right beside the first tee and good facilities at the clubhouse.